Large numbers of syrphid, or flower, flies are being seen. They are small flies, usually 1/4 inch or shorter, with yellow and black or brown bands on the abdomen. They hover around your arms when you have been perspiring and land to lap up the sweat. This hovering also gives them the name of hover flies. 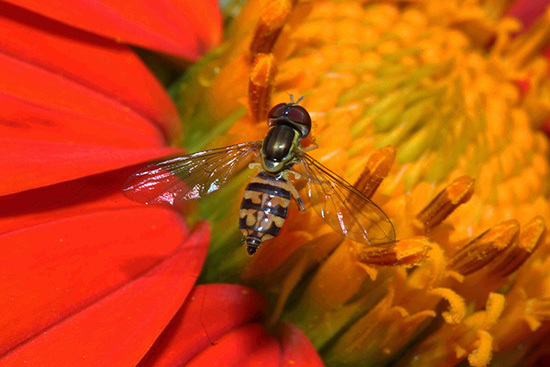 They are called flower flies because they are commonly found on flowers, pollinating as they move from flower to flower. They are called syrphid flies because they are in the fly family Syrphidae. Illinois sweat bees are 1/4-inch-long, metallic green, brown, or black bees that are also be attracted to perspiration. The only yellow and black stinging insects commonly attracted to perspiration are yellowjackets. These wasps are about 1/2 inch long and easily recognized by most people. Although commonly referred to as sweat bees, syrphid flies cannot sting. While they are feeding on perspiration, their mouthparts can usually be felt; and on sensitive areas, a person may feel a slight pinch. These insects have one pair of wings instead of the two pairs characteristic of bees and wasps. Like many people in the Midwest, I grew up being told that these insects were sweat bees. Only when I went to college did I learn the difference. Syrphid flies are a diverse group, with the larvae being primarily feeders on dead organic matter and predators of aphids. The white to gray, legless larvae may have become abundant, feeding on aphids and other small, soft-bodied, slow-moving insects. A possibility is that the larvae have been feeding on the aphids that are very common on corn in Illinois at this time of year.